A few days ago, a redditor named pdxkat posted a pretty interesting entry on the Undisclosed Subreddit about Dr. William Rodriguez. Dr. Rodriguez was the Forensic Anthropologist and Chief Deputy Medical Examiner for the Armed Forces Institute of Pathology who supervised the disinterment of Hae Min Lee's body from Leakin Park. Among other things, pdxkat's post references a case in which (1) the victim was strangled; (2) her killer buried her in a very shallow grave in a wooded area in Baltimore City; (3) Dr. Rodriguez supervised the disinterment; and (4) Dr. Margarita Korell performed the autopsy. So, why did Dr. Rodriguez act so differently in that case than he did in Adnan's case? William C. Rodriguez, III, Ph.D., and the assembled excavation team conducted an excavation in the area that Metheny pointed out. The team used standard excavation techniques to carefully unearth the remains. [ ] It is notable that at the excavation site, Dr. Rodriguez discovered that the cranium was missing. The skeletal remains of Catherine Magaziner were recovered from a very shallow grave and transported to the Office of the Chief Medical Examiner. In Dr. Rodriguez's expert opinion, the morphology exhibited by the mandible and the postcranial skeleton is consistent with that of an adult female, and a craniometric analysis indicated that the race is consistent with a Caucasoid. Ms. Magaziner was a Caucasian adult female. 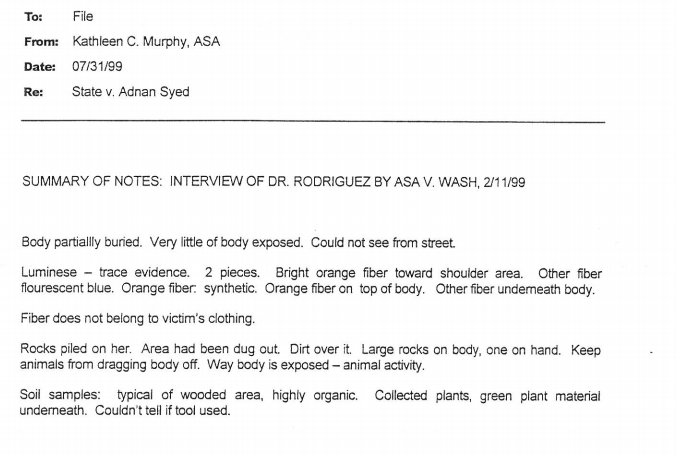 So, Dr. Rodriguez seemingly wrote a fairly detailed report after disinterment, and with good reason. Magaziner's body was disinterred on December 18, 1996, and Metheny said that he (1) strangled and buried her in July 1994; and (2) returned six months later to dig up and remove her skull. Dr. Margarita Korell,...an Assistant Medical Examiner in the Office of the Chief Medical Examiner....performed a postmortem examination of the skeletal remains of Catherine Magaziner. [ ] As an expert in forensic pathology, Dr. Korell concluded that the autopsy findings and circumstances surrounding the victim's death as related to her by Detective Pennington indicate that she most probably died of asphyxia. (2) ASA Wash interviewed Dr. Rodriguez on February 11, 1999, either recording the interview or taking notes; (2) ASA Murphy thereafter took notes from that interview; and (3) the above document is Murphy's summary of her own notes. (1) the State did not know when Hae was killed between January 13th and February 9th, and time of death could have been important; (2) the State didn't know when Hae was buried between January 13th and February 9th, and time of burial could have been important; (3) Dr. Rodriguez himself indicated at trial that he was unsure whether Hae's "grave" was dug out or a natural depression; (4) Dr. Korell was not present for the disinterment; and (5) Hae's lividity did not match her burial position. (1) trying to establish that Hae could have been buried in the 7:00 hour; and (2) trying to make sense of Jay's varying stories of what tools were used in the burial. Instead, there is no report by Dr. Rodriguez, and there are no notes. Maybe as important is something else we're missing: ASA Wash's documentation of her February 11th interview with Dr. Rodriguez. I think we'd all agree that this documentation, created two days after disinterment, is more reliable than ASA Murphy's secondhand summary, created over five and a half months later. I think that we'd also agree that Wash's documentation was more extensive, which is why Murphy's above document is titled "Summary of Notes." So, where is that documentation? What information does it contain beyond the information in Murphy's summary of notes? Why was it never turned over in 1999/2000 or in response to numerous MPIA requests, including a recent one sent to the Baltimore County Police Department? This takes us to an interesting issue under Maryland law. On the podcast, we discussed, Jencks/Carr, which requires Maryland prosecutors to turn over prior statements by State witnesses to the defense. Jencks/Carr clearly applies to things written by a witness and recordings/transcriptions of statements by a witness. But what about notes taken by a State agent while interviewing a witness? Well, in Jones v. State, 530 A.2d 743 (Md. 1987), the Court of Appeals of Maryland essentially created a dichotomy: When a State agent takes notes while interviewing a prosecution witness, those notes need to be turned over under Jencks/Carr if the witness "signed," "adopted," or "approved" the notes; if he didn't, the State doesn't need to turn over the notes. This makes me wonder whether Wash didn't not get such approval from Dr. Rodriguez to insulate the notes from discovery*** or whether she did get such approval, meaning that there was a violation of Jencks/Carr. Of course, Brady trumps Jencks/Carr, so there was a Constitutional violation if Wash's notes contained material exculpatory evidence, regardless of whether they were adopted by Dr. Rodriguez. *This was two years to the day before Hae's autopsy. **I don't know, however, whether she was present for the disinterment of Magaziner. ***In the process making the notes much less reliable. Is it possible he may have lost his notes? Ben. Yes of course it's possible. However given the behavior of the prosecutors and police in this case its not as likely to be a mistake. Both parties did things that should have been called out by the defense at the very least (but we all know why that didn't happen here). They don't care about finding evidence of the killer, they wanted the case to go the way they wanted whether or not they were correct. It's a huge issue in Adnan's case across the board. Colin: See below for a comment on Susan’s blog – does the poster have a point re. challening a scientist in court if not following guidelines? Given that Hae's fourth period on 1/13/99 was Computer Information, it is likely that she had access to her email/internet during that period. My thought is that it is likely the "something came up" content, if it exists, was in her email or AOL instant messenger. There are two main reasons for this belief. (1) In 1999, pagers, like cell phones, were banned from high school campuses across the country; and (2) Hae was most certainly active on email (she created an email account for Adnan). It is inconceivable to me that her email was not searched, but I wouldn't be surprised either - given the other misses. Ben: Yes, and that would make things even worse, in my opinion. Megan: There was certainly a pattern here. Cupcake: Sure, Gutierrez could have challenged the expert(s) on cross-examination on these grounds. Chris: That’s definitely a possibility I’ve considered. Isn't there a work product exemption for those notes too? "Dr. Rodriguez himself indicated at trial that he was unsure whether Hae's "grave" was dug out or a natural depression"
I’d still guess it would be pretty easy to tell that a hole had been dug, or had been attempted to be dug. Unless of course it hadn’t and Jay was just making this up, like everything else. Dr. Rodriguez is considered one of the leading experts in the world regarding the evaluation of forensic remains. I personally find it unbelievable that such an esteemed an experienced anthropologist will be unable to determine if there was any sign of digging. However he did testify to that at the trial. Make of it what you want. If you search at his career on Google, you will find him listed as a reference in all sorts of distinguished journals. Here is a quick overview of his career. Colin - In my dealings with military, even retired, they are pedantic about SOP. Can we determine if the different results come from different questions? Did someone in the prosecution of Metheny ask for, push for, or demand this level of detail? It seems more likely than not that something else is going on, such as documents that were not brought forward. But the devil needs an advocate. Did anyone think to process a FOIA through Gov't channels where Dr Rodriguez worked (Armed Forces Institute of Pathology)? While the State may not have required a report for "their purposes", the Gov't may have required Dr Rodriguez to submit a report for the Gov't files. Something to think about! I find it hard to believe that Dr Roderiguez didn't actually take notes. What seems more likely is that any notes he took, were swept under the rug if the prosecution indicated it was "that type of case." Because Metheny's case was already worked out ahead of time, there was no need to obfuscate and impede the defense. The whole thing just reeks of shadiness, and I doubt very much this wasn't the normal routine used by Baltimore prosecutors. Hi Colin I think it's very likely that Rodriguez did take notes. He was not asked to produce a report, probably for the disclosure reasons you note above. Given that he knew that he would be called to testify and be cross examined on that testimony months later it seems only common sense that he would have taken his own notes at the time. At both trials he did give detailed testimony. I can't think of a question that he did not answer, or even one that he floundered over. 1After you disinterred this body and you made your notations, sir, were you asked to produce a report?